2. Bailaores: 7 vídeos didácticos con los estilos flamencos: soleá, tangos, bulerías, alboreá, alegrías y seguiriyas. 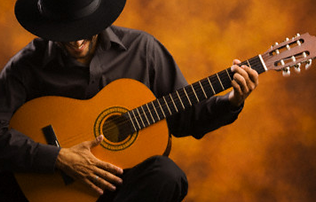 A didactic collection of flamenco: singing, playing and dancing. 8 of dansing, playing 'toque' and singing; 1 of singing; 1 of drums and 1 DVD. Ritmo Flamenco Rhythm is the definitive collection to learn the keys of flamenco: dancing, playing and singing. A easy learning method for all types of backgrounds. And ideal complement of flamenco from around the world for scholars and aficionados whor aspire to be interpreters of this unique art. A collection composed by ten CDs and a DVD to get started in flamenco, which tackles dancing as well as singing and guitar playing. Each of the CDs deals with two palos (flamenco forms), and finally, the DVD features performances by first-rate bailaores (flamenco dancers) to illustrate the contents of the ten CDs. The first eight CDs are devoted to dancing, the ninth to percussion and the tenth to new flamenco. First you hear the singing, the dancing and the guitar playing for each form. The following track presents a repetition of the same palo, but this time without the dancing, that is, just with the singing and guitar playing so that the apprentice dancer can practice. The third track reinstates the dancing alongside the singing, with the guitar playing removed so as to allow guitarists to practice. In the fourth track, it is the turn of the cantaor (flamenco singer) to practice, and the fifth track only includes the meter. Each of the CDs also includes a final track in which the bailaores give a demonstration of the palo in question. CD 1: Tangos and Tarantos. Bailaor: Rafael Campallo. CD 4: Soleá and Bulerías. Bailaor: El Torombo. CD 7: Soleá and Jaleos. Bailaora: Adela Campallo. Susana Casas. It also features the “making of” the collection. Learning method in Spanish, English, French and Japanese.